One of my goals this year is to make going out of the house more a part of our homeschooling. Taking all three of my kids somewhere has always been a struggle for me. I never seem to get all my ducks in a row so that I feel freed up to leave the house. You know: lunches packed, dinner in the crock pot, house clean, schoolwork prepped and organized… This is a list that rarely gets completed! Even a simple errand feels overwhelming to me. I admit it adds to my mommy guilt daily that I must be turning my kids into hermits like me. I know that getting my kids out of the house and into a new environment is really, really important. I’ve tried weekly park days. But oh my, all the work just to get them prepped to leave the house, dressed, and into the car! It all seems wasted on the chaos of 3 kids fighting over the only swing. And I know I won’t escape the near heart attack I’ll get from seeing my tiny 2-year-old towering 50 stories above me wanting to go down the largest slide in the universe. I’ve tried monthly field trips. We’ve gone on many field trips through our wonderful community group of homeschooling families. My kids have loved their packed lunches, guided tours and learning together with their friends. Yes, group field trips are a wonderful thing. Unless, of course, you have a whiny, wiggly toddler. If you have a baby, toddler, or just-wants-to-have-fun preschooler in the mix, going on a formal field trip can be super discouraging. Museums, zoos, science centers, and other destinations offer incredible learning experiences for older students but can be downright overwhelming with young ones in tow. You often end up paying good money for everyone to go and then miss out on great teaching moments while fumbling with a stroller, bottles, snacks, screams and tantrums. But what’s a mom of little ones to do? If you pass on educational excursions because the thought of taking your young ones overwhelms you, I totally get it. We’ve missed many wonderful field trips simply because I was being a big chicken. I just didn’t have the energy for another 2 hour walking toddler wrestling match with flying clipboards and endless shushing! If now just isn’t the season for amazing, coordinated group trips, you can still train your kids – and yourself – to take educational field trips by starting small and visiting everyday places. With a little preparation you can make an amazing field trip out of a visit to any everyday place. You’ll be close to home, be completely flexible with your time, and be able to make age appropriate lessons and activities to match your children’s abilities and interests. Let your kids help choose the field trip. You can let your kids choose the next destination from a list you make, or pick one from a jar. Whenever your kids ask questions about something, write down an excursion that would help them explore the answer and add it to the list or jar. Visit the website for the store or destination, even if you don’t think they’ll have anything helpful there. You may be surprised what you find on a store or organization’s website. For example, we discovered that our local discount grocery store has its own kid’s club that comes with a booklet and stickers. I have very easily expanded it into a nutrition lesson for my daughters. Don’t answer all your kids’ questions. Encourage your kids to ask employees questions. They’ll learn people skills and how to get answers from someone besides mom. It will also give you a break from all the why’s and what’s that’s! Have a few key points or “truth nuggets” you’d like your kids to discover on the trip. Lead them towards these discoveries while you’re out, but keep the list short so you can have freedom to explore other interests. Let them go off on a tangent. 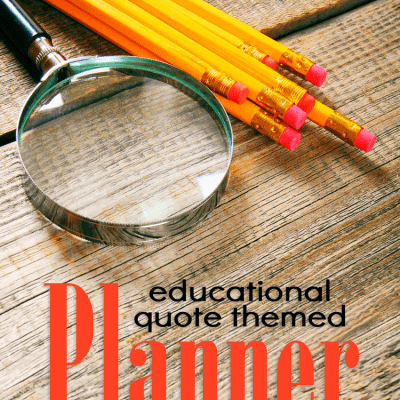 Who knows what they’ll discover when you’re flexible with your plan. Let them explore what interests them and you will inspire a joy of learning. Have your children give a field trip report at the dinner table. I’m a big fan of the dinner table school report. Reiterating what your kids learned on their field trip will help them retain their knowledge and build community within your family. Easily turn a trip to your local pet store into an intro to zoology with free printables you find online and resources available on the store’s website. It was a random trip to a pet store that got me thinking about taking field trips to everyday places. It’s what inspired me to make my free Pet Store Zoology Lesson Pack which has pages for younger children and older children as well. Young Children: Try playing animal bingo, find animals of every color, or have them hunt for an animal that starts with a letter you pick. Older Children: Play vertebrate or invertebrate, research scientific names, compare & contrast habitat conditions, etc. Going to the music store is one of my favorite outings. There are great free printables online that you can print and take with you to make it an educational field trip. Check out my Pinterest board for everyday field trips for some helpful links. Young Children: Print out pictures of instruments and have young ones put a sticker on or cross out each instrument as they find them in the store. Classify instruments as percussion, woodwind, brass or strings as you see them. Older Children: Older kids can search for musical notations in a piece of music, and choose an instrument to learn about. Expand your lessons when you get home with word searches, instrument videos, and music activities. Consider renting an instrument for a month for all the kids to try out – often for less than $40. And the Internet is packed with free music lessons. Head to your nearest music store and see where your adventure leads you! Oh the many things you can do in a grocery store! Grocery stores are great for learning because you can cover so many subjects – math, nutrition, reading, colors, directions, etc. A simple blank bingo card like this one can be customized for your trip. Crop to 9 squares for little ones. Young Children: Your smallest shoppers can play a simple game of bingo that you can prep with a blank bingo card. Print out pretend shopping lists for beginning readers, or food cards for various activities you can do in the store. Older Children: Older shoppers can guess weights of produce, work with a budget, and practice reading labels on packages. You can let them go off on their own in the grocery store and write down prices for as many items as they can find on a grocery store scavenger hunt. Have them first guess what it will all cost and make their guess their “budget.” When they’re done have them total up all the prices and see if they came in under or over budget. International Store or Section: Introduce the idea of different languages by visiting an international store or the international section in your grocery store. Can they find one item from every major continent? Can they locate the countries of origin for chosen items on a map? Many parks, libraries, and cities have botanical gardens that are free to visit and explore. This can make a great destination for a short field trip to get you learning outdoors. Try bringing some watercolors along for an all-ages art project where your kids can paint what they see. Young Children: Try some color recognition or color scavenger hunts. Find bugs and look at them with a magnifying glass. Discover and name the parts of a plant. Older Children: Learn scientific names for plants, identify insects and classify them as beneficial or harmful. Try leaf rubbings and tree identification. You can make an outstanding field trip to a local river, lake, or park. Create a science day, learn orienteering, or use a nature guide like my free Nature Explorer’s Guide printable. Young Children: Explore bugs, plants, and water samples with a magnifying glass. Make a bingo card or scavenger hunt to find items like rocks, pinecones, worms, birds, etc. Introduce them to the idea of maps and talk about compass directions. Older Children: Look for microorganisms in water samples with a microscope, view plant cells from a leaf or blade of grass, collect and identify rocks, make a science collection, learn map reading skills and introduce orienteering. 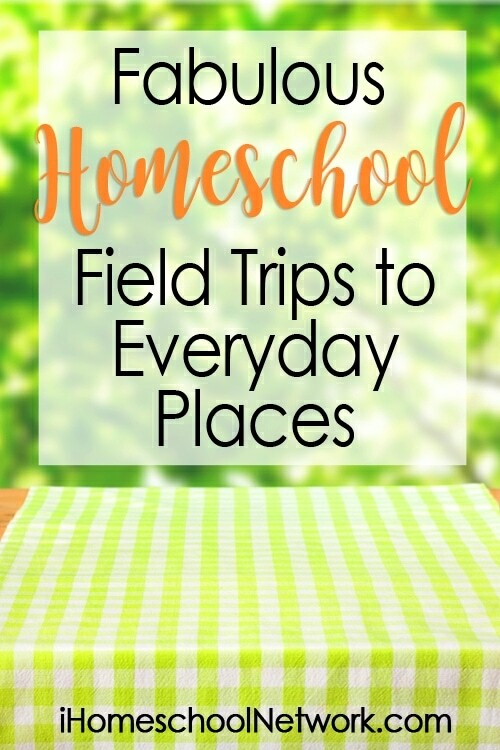 I’ve gathered plenty of free printables for each of these destinations on my Pinterest board Everyday Field Trips, so feel free to start there and jump-start your next field trip adventure! What about you? Would you try a family field trip to an everyday place? Can you think of other local places that would make great, low pressure field trips? Awesome idea. Learning can be anywhere! Thanks for sharing. Local coin shops are a wonderful avenue for history. These are such wonderful teachable moments. Thank you for sharing this. I am a stay at home dad and I have two young daughters (3 and 5). It is hard for me to get them ready to just go to the park. I can only imagine what it is like with three…. It would be great if my kids were hermits like myself, but they love to socialize too much. Because of my daughters ages, organized field trips are too much trouble at this point. I enjoyed all of your suggestions. Especially how they open up possibilities for learning no matter where we go. Thank you for the great post! Awesome ideas! As a fellow homeschooled, I am always looking for new ideas for field trips. I am going to try some of your ideas. Thanks!